Patreon, a subscription-based funding site for artists, has just raised $15 million in a Series A from Alexis Ohanian, Sam Altman, David Marcus, Joshua Reeves and a bevy of other tech entrepreneurs. There were 17 angel investors and VCs in all who contributed to this series, with Danny Rimer of Index Ventures leading the round. Patreon founders Jack Conte and Sam Yam tell TechCrunch that they looked very carefully over the course of five months to curate the right investors for this round. “We wanted investors who believed in the arts and understand our mission,” said Conte. All of the investors, noted Conte, have some interest in the arts. Rimer, for instance, is on the SFMoMa Board of Trustees. Conte went on to say that his company could have raised even more if needed. Company revenues grew 10x in the last five months, allowing the founders some room to choose whom they would like to take investment from. Conte rose to Internet fame as one-half of YouTube darling Pomplamoose. He founded Patreon with AdWhirl founder Yam as a way to support artists in their pursuit of a decent living while doing what they love. Conte also gave me an exclusive sneak peak into the new site design his team just pushed live today. You’ll notice the focus is much more on content instead of individual artists now as the main focus. “Think about why people love and share something online. It’s because of the content. We wanted to showcase what the artists were doing instead,” said Conte. Ability to see how many other patrons are live on the page at the same time as you. It will look very similar to a creation page, but the artist will have to turn it on to launch the ability to chat, etc. Only a handful of carefully selected artists will be using this mode at first. The plan is to eventually roll it out to everyone with a channel. There will also be a special half-day podcast happening from 9 am – noon Pacific time today to celebrate the site redesign. Founders, investors and several others will be on the channel during this time. You can tune in on Patreon’s own channel here: patreon.com/patreon. 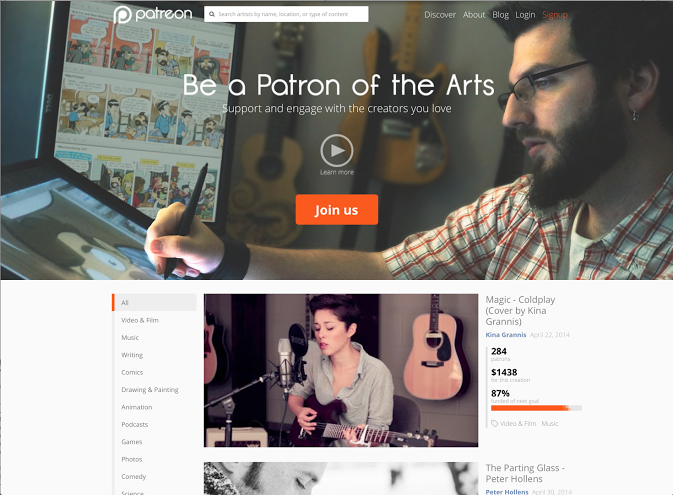 Patreon engineers are in the midst of cranking out a mobile version of the site for iOS. And flush with cash, the company is now busy hiring as well. The founders tell me they expect to have up to 13 employees in the next week.